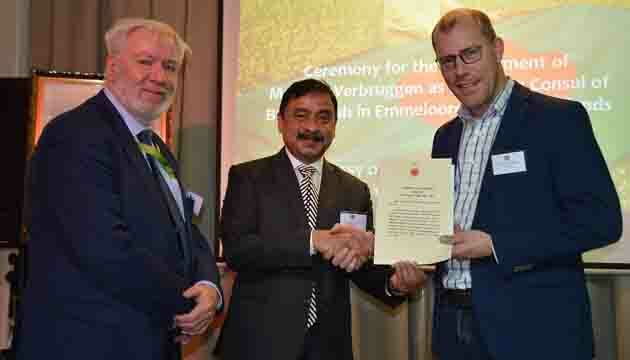 Bangladesh handed over the Letter of Commission to Mr Maarten Verbruggen, newly appointed Honorary Consul of Bangladesh in Emmeloord with jurisdiction for the provinces of North-Holland and Flevoland of the Netherlands. Mr. Maarten Verbruggen has been associated with Bangladesh over the last eighteen years owning to his professional work in the medical sector of Bangladesh in the early years and later through businesses with Bangladesh in agriculture and light engineering sectors. 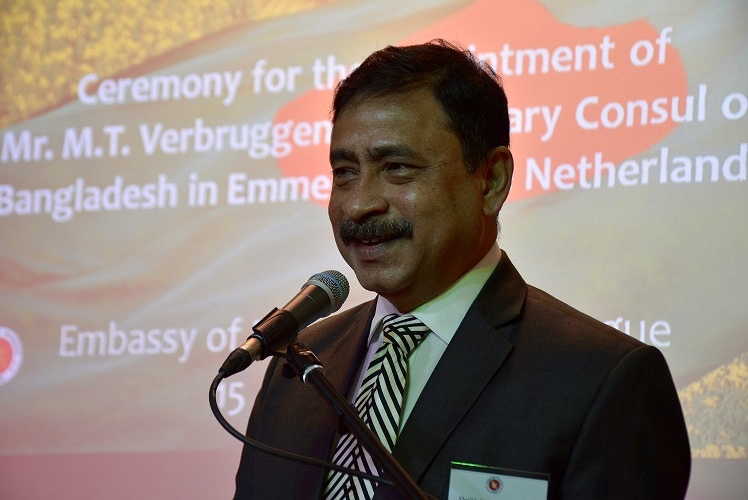 Bangladesh Ambassador to the Netherlands Sheikh Mohammed Belal handed over the Letter of Commission to Mr Maarten Verbruggen in a simple ceremony today at the Embassy of Bangladesh. Mr Jan-de Boer, Senior Policy Officer Asia and Oceania Department of the Ministry of Foreign Affairs of the Netherlands, Representatives from the Netherlands Enterprise Agency (RVO), Dutch Development Bank (FMO), Dutch agriculture entrepreneurs and members of Bangladesh community living in the North-Holland and Flevoland provinces also joined the occasion. 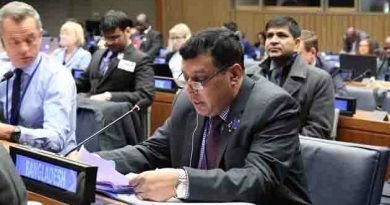 Ambassador Sheikh Mohammed Belal hoped that Mr Maarten Verbruggen would be instrumental in introducing the Dutch agricultural innovation and creativity in our agriculture sector, especially in the areas of technology-based agricultural production, farm produce processing, and agribusiness, etc given his extensive experience in the agriculture sector of both Bangladesh and the Netherlands. Taking the opportunity, the Ambassador appreciated the Netherlands Enterprise Agency as well as the consortium partner companies of the Netherlands for their undertaking Potato Impact Cluster project worth of Euro 900,000 to find an integrated solution to address the high post-harvest losses in the potato sector of Bangladesh. 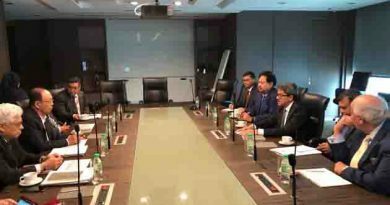 The newly appointed Honorary Consul narrated his long association with Bangladesh and appreciated highly the development spree that has taken place in Bangladesh over the last one decade. 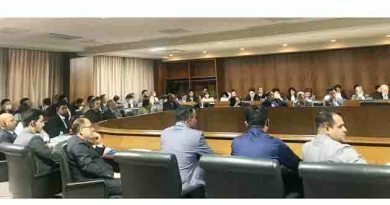 He expressed his optimism that Bangladesh will develop in an accelerated speed in the coming years and assured to contribute to further consolidate trade and business relations between Bangladesh and the Netherlands, especially in the agriculture sector. 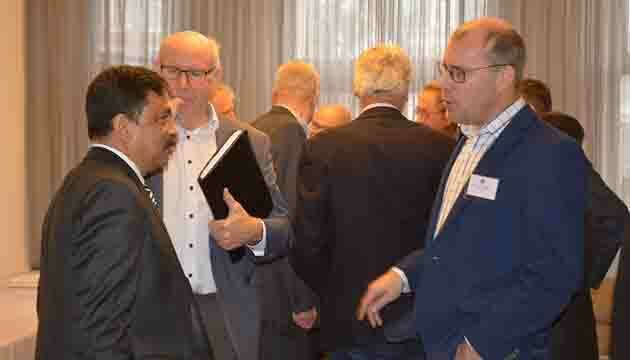 The Senior Policy Officer of the Dutch Ministry of Foreign Affairs highlighted the continued deepening of bilateral relations between Bangladesh and the Netherlands and assured his Ministry’s support to the Honorary Consul in the discharge of his mandate. ← Suspected militants have attacked a luxury hotel complex in Nairobi, killing at least six people.